BALTIMORE, Jan. 19, 2017 /PRNewswire-USNewswire/ -- Wounded Warrior Project® (WWP) veterans commemorated Martin Luther King Jr. Day by volunteering in the Johnson Square community. During the outing, warriors experienced what is possible at social events that connect them with fellow service members. 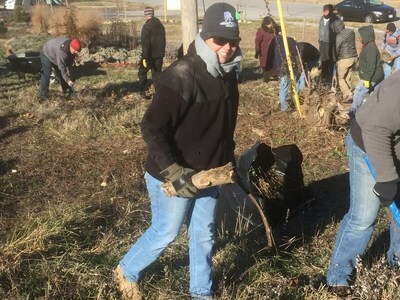 WWP participants joined The 6th Branch – a Baltimore-based volunteer organization – for its sixth annual MLK Jr. Day of Service. Other groups involved included Team Rubicon, AmeriCorps NCCC, and The Mission Continues, totaling more than 300 volunteers. To support development in the community, teams cleared abandoned lots, picked up trash, removed brush, and did light construction. "I wanted the chance to give back, and Wounded Warrior Project provided the vehicle to do that," said Marine Corps veteran Ed Morneault. "Participating in these types of events gives warriors like me a sense of purpose, and they provide team-building opportunities." These connection activities can help injured warriors cope with stress and emotional concerns. In a WWP survey of the injured warriors it serves, more than half of survey respondents (51.7 percent) talked with fellow veterans to address their mental health issues, and 29.6 percent expressed physical activity helps. "This organization has helped me connect and interact with other veterans with whom I share a common bond," Ed said. "Wounded Warrior Project is also a valuable source of networking and information for veterans." Staff members introduced warriors to various programs to help them in their recovery processes. WWP offers programs that assist injured veterans with mental health, physical health and wellness, career and benefits counseling, and connecting with other warriors. Generous donors make it possible for wounded warriors to take part in outreach activities and benefit from program resources at no cost to them. "I spoke with a woman at the event who said her husband was a veteran but refused to go to the Department of Veterans Affairs to get his disability rating," Ed said. "I gave her my information in hopes that I – alongside Wounded Warrior Project – could help point him in the right direction." To learn and see more about how WWP's programs and services connect, serve, and empower wounded warriors, visit http://newsroom.woundedwarriorproject.org/ and click on multimedia.